We’re at midcourt, and the ball is about to go up…it’s Monday Tip-Off! Start your week here at the NLSC with a feature that’s dedicated to opinions, commentary, and other fun stuff related to NBA Live, NBA 2K, and other basketball video games. This week, I’m tipping things off with a look at how modding projects fall apart, while discussing a recent personal example. Although I’m not as involved with modding as I once was, I won’t deny the lure of working on roster updates. I’ve previously discussed some of the mods that I’d like to make, should I be able to put aside the free time and get sufficiently motivated. That certainly still holds true, and as previously mentioned, I do have a list of modding ideas, similar to my lists of topics for the Monday Tip-Off, Wayback Wednesday, and Friday Five features. Every so often, I might do a little bit of preliminary work on one of those ideas, but aside from one or two beta releases, a majority of them haven’t progressed any further than that. I’ve really enjoyed producing my Wayback Wednesday content since I introduced the feature a couple of years ago, as it’s been a way to reminisce about old favourites, and talk about some interesting modes, community history, and basketball gaming trivia. It’s also provided an opportunity to indulge in some retro gaming, which I enjoy doing across a variety of genres. Of course, I sometimes find myself becoming drawn towards an old release, especially if it’s one that I’ve spent a considerable amount of time modding. Such was the case with NBA Live 2003, where I recently toyed with the idea of a mod, only to be reminded of how easily projects can fall apart. Welcome to this week’s edition of The Friday Five! The Friday Five is a feature that I post every Friday in which I give my thoughts on a topic that’s related to NBA Live, NBA 2K, and other basketball video games, as well as the real NBA, and other areas of interest to our community. The feature is presented as either a list of five items, or in the form of a Top 5 countdown. This week’s Five is a list of five basketball games that I’m oddly nostalgic for. We each have our all-time favourite basketball games. Even when they’ve been surpassed by new titles, it’s natural to feel nostalgic towards old favourites. In the best case scenario, some of them may still hold up reasonably well, and be fun to play years later. 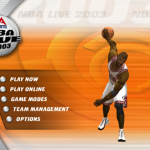 As far as the sim-oriented basketball games are concerned, my list would include NBA Live 95, NBA Live 96, NBA Live 2000, NBA Live 2004, NBA Live 2005, NBA Live 06, and now that a few years have passed, NBA 2K11, NBA 2K12, and NBA 2K13. In terms of arcade basketball games, there’s NBA Jam Tournament Edition, NBA Street Homecourt, and more recently, NBA Jam: On Fire Edition. I’m nostalgic for those titles because they rank among my all-time favourites, but then there are also basketball games that I feel an affinity for, even though they wouldn’t make my personal top five or ten. Some of those games are quite flawed, or at the very least haven’t aged too well, yet there’s something that draws me to them. Sometimes it’s the general atmosphere, sometimes it’s an ultimately inconsequential detail such as the soundtrack, and sometimes it has more to do with when they came out and where I was at in my life at the time. Whatever the case may be, these are five basketball games that I’m oddly nostalgic for, given the circumstances.